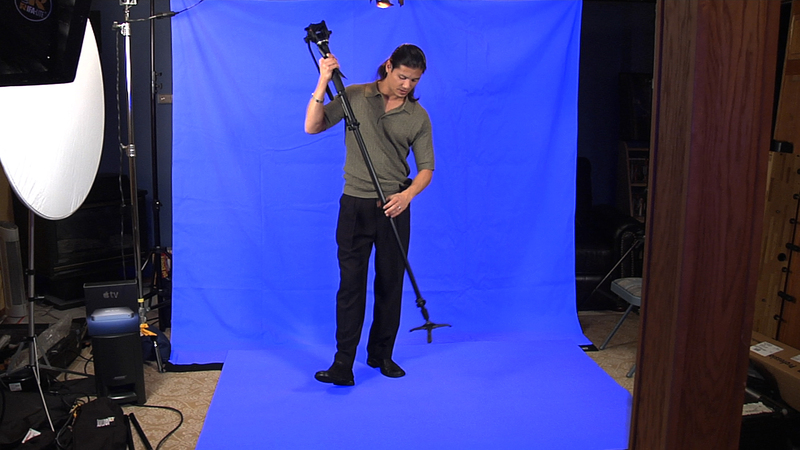 Traditional chroma key involves a complex professional studio setup with a large blue screen or green screen background. Reflecmedia’s innovative range of flexible, portable, safe and easy to use products mean that with minimal lighting and technical expertise almost any location can be used as a virtual studio at a fraction of the usual costs – providing endless creative possibilities for digital content creation. Leading broadcasters, production companies and educators around the world use and trust Reflecmedia’s multi award-winning products. We here at DVeStore use Reflecmedia ourselves, and take great pride in being able to recommend this great product with full knowledge of it’s capabilities and practical uses, as well as it’s benefits to you. You can also light up a traditional green curtain with simple Lowel Tota lights bounced into an Umbrella to produce soft and even light. However, lights take energy, cause massive amount of heat and it takes time to create an even background with no shadows or harsh variations (gradations from a darker green to a brighter green). These harsh variations often times make keying traditional green screen in post a real chore. Introducing the Reflecmedia LED LiteRing which mounts directly to the front of the camera. 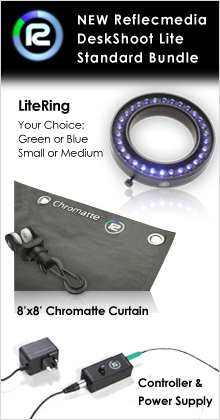 Believe it or not, these low powered LED’s provide enough luminance to light up a 30′ chromatte curtain from 30′ away! Yes, entire news room as seen here. When the light from the Reflecmedia LED LiteRing hits the special Chromatte background, the light is reflected back and what the camera sees is a perfectly even blue or green sceen! The background is a silvery gray color upon initial examination. A closer look reveals tiny glass beads that reflect incoming light like “cats eyes” do when car headlights approach. This is what makes the material reflect the color of the LED Litering, in a brilliant blue or green! Here is an example where we were able to shoot in a tiny basement and get the look of a big budget studio! – With Reflecmedia’s Litering, the camera needs to be 10′ away from the subject. So you’ll need about a 12′ room. – Teleprompters do not work well with the Ringlite. You’ll need to position the prompter above or below the lens. There you have it, if none of the above affects your style of production, you’re good to go! The Most Popular Reflecmedia system by far is the Deskshoot 8’x8′ Kit – this kit includes everything you need to get up and going right away. Do you have a small camcorder, such as a Canon HV20 or Sony Sr-12? Try the new Microlite! Reflecmedia can pay for itself!! 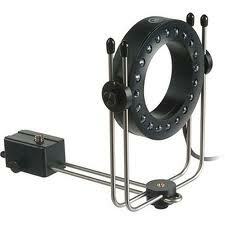 You need to take into account the valuable time it can take to properly position the lights for a traditional set-up. Next is the electricity to run the lights. Now what about the Air Conditioning to cool the room from the hotlights? Nattress releases Big Box of Tricks plugin set!